Anybody who was born outside of South Africa to a South African citizen. His or her birth has to be registered in line with the births and deaths registration act 51 of 1992. Permanent Resident holders of 5 or more years can apply for citizenship. 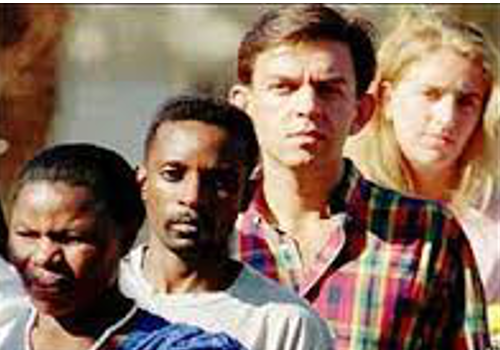 Anybody married to a South African citizen qualifies for naturalisation, two years after receiving his or her permanent residence at the time of marriage. A child under 21 who has permanent residence Visa qualifies for naturalization immediately after the Visa is issued. Serves in the armed forces of another country, where he or she is also a citizen, while is at war with South Africa. The certificate of naturalisation was obtained fraudulently or false information was supplied. He or she holds the citizenship of another country and has, at any time, been sentenced to 12 months imprisonment in any country for an offence that also would have been an offence in South Africa. Any person who wants to apply for citizenship in another country must apply to the Minister of Home Affairs to retain his or her South African citizenship before acquiring the citizenship of the other country. can apply for the reinstatement of his/her South African citizenship. However this person must return permanently to South Africa. Fill out the enquiry form on the right, to give us more information on your current status. Once we have all your information, we can deduce whether or not you will qualify for citizenship. Testimonials are the best way we can show how satisfied our clients are with us and they are our best advertisement. Just look what our clients have to say about SAMI! "This is so great, I have now been out and gotten us not only one but two bottles of Graham Beck! At least one of the glasses will be drunk as a salute to you and Rod and everyone else at SAMI! Thank you so much for all your help, your help has really been more than invaluable to us!" Newsletters are always the best way to keep our clients informed of the rapid changes in the immigration world and we can update you in this regard by your subscribing to our free newsletter. SAMI issues a monthly Newsletter to update you on topical immigration and related matters that we believe you should be aware of especially with regard to the procedures and rules pertaining thereto. These newsletters will provide you with useful information on any aspect of life related to immigration and relocation. If you are interested in a visa or just to visit you should subscribe to the Free Newsletter service of SAMI. Disclaimer SA Migration subscribe to Google’s rules on transparency and therefore state that SA Migration is registered with the South African Department of Home Affairs – Reg. No: 2004/01/0067. We are a privately-owned immigration practice and as such comply with the Immigration Act of South Africa. We are not the South African Government. We charge for our expertise in successfully applying for temporary and permanent residency services. Forms that are supplied during the process can be collected free of charge at any Department of Home Affairs office but are provided as part of the service. Users who wish to do so can contact the Department of Home Affairs directly at www.home-affairs.gov.za.